We’d love your help. Let us know what’s wrong with this preview of Aunt Sass by P.L. Travers. In the 1940s, P. L. Travers wrote three stories, which she gave as Christmas gifts to friends. Now, for the first time, they are available to a wider readership. Printed on board, with beautiful illustrations, this will be the perfect gift book for Christmas. To ask other readers questions about Aunt Sass, please sign up. 3.5 Mary Poppins, fond memories. Read the book before ever seeing the movie, saw the movie with my children when they were young. Though the book was different from the movie, much darker, I enjoyed both. These threes stories are not really Christmas stories, though they were written by the author as a Christmas gift for family members. The first story, Aunt Sass was my favorite. An inside look at a the woman who inspired Mary Poppins, possibly that of her own great aunt. What an absolute charact 3.5 Mary Poppins, fond memories. Read the book before ever seeing the movie, saw the movie with my children when they were young. Though the book was different from the movie, much darker, I enjoyed both. These threes stories are not really Christmas stories, though they were written by the author as a Christmas gift for family members. The first story, Aunt Sass was my favorite. An inside look at a the woman who inspired Mary Poppins, possibly that of her own great aunt. What an absolute character, can definitely see Mary's brisk personality in these pages. The second story, Ah Wong, was both humorous and sad. Would not be politically correct today, but this man from China, was such an amazing character. Definitely had his own views and opinions, and not at all afraid to share them. The ending brings closure in an unusual and heartfelt way. The third story, Johnny Delaney, an Irishman, who had decided views on how children should be raised. Though this was my least favorite, it was still a good one. Just paled because of the strength of the first two. Było super, dopóki nie trafiłam na "plutonową jaskinię bytu" - serio? Jestem małostkowa i takie duperele mi przeszkadzają. “Aunt Sass” is a semi-autobiographical and truly exquisite testimony about Pamela L. Travers’s memorable great aunt Helen Morehead (Aunt Ellie). “Aunt Sass” was published privately in 1941 in a limited edition of five hundred copies. It was intended as a Christmas gift for friends, although the theme had nothing to do with Christmas. I wonder what Pamela’s friends’ reactions were. Were they touched? Did they care about her childhood memories? Did they discuss the story with her? Or, did they tos “Aunt Sass” is a semi-autobiographical and truly exquisite testimony about Pamela L. Travers’s memorable great aunt Helen Morehead (Aunt Ellie). I will not, you old Beast! I shouted to her. I am not crying, it’s only my eyes. " The story doesn’t tell us explicitly, but it is possible that Ellie, herself, was overwhelmed by the events and by the long-term task of assisting the financial and moral needs of her niece and her three young children. “Here, take the cherries to the little ones and tell your mother Aunt Sass is a bitter old woman and that she didn’t mean a word if it." Aunt Ellie appears to have had somewhat of a split personality; a rough exterior and mean demeanor with some occasional sentimental deeds. Reportedly, extremely opinionated, Ellie viewed the world in either black or white. She also believed herself to be (or wanted others to think so) the retainer of all truth and expected, as “a general in a War Office,” to be obeyed on the spot. For little Pamela, the ambiguity of Aunt Ellie proved itself frightening, but at the same time, her presence provided a sense of safety, of being taken in charge by someone who appeared almighty and powerful; just like the Banks children in the Mary Poppins stories. Ellie’s power resided in her wealth and in her use of constant criticism and gossip as her weapons of coercion and disempowerment. I suspect her of being bullied by her own inner fears and disappointments, and that whenever guilt arose she tried to compensate for her exteriorized bullying by the occasional fairy godmother kind of attitude, which her financial resources allowed her to do. She did pay for Pamela’s boarding school, her typewriter, and her fare to England. As the years passed by, little Pamela grew up to become a young woman with artistic talents and a mind of her own. I also couldn’t help but notice something else, a similarity of fortunes. It is almost as if Pamela in some way professed her own future. She too lived well into her nineties, she too was quite self-obsessed and self-conscious, and it was only in her later writings that she expressed this same willingness to open up and at last be vulnerable; something that she resisted during her entire life. It is true then that Pamela L. Travers wrote more than she knew, although when she said: “We write more than we know we are writing. We do not guess at the roots that made our fruit” she was referring to the resemblance between Mary Poppins and her Great Aunt Ellie. Strangely enough, when interviewed, Pamela always maintained that she didn’t know where Mary Poppins came from. A comment made by Camillus Travers, Pamela’s adoptive son, comes to mind. Talking about his mother he said: “My mother was Mary Poppins.” And if Mary Poppins was based on the character of Helen Morehead, then it is only logical to assume that as Pamela grew older she ended up reproducing her bitter aunt’s behavior. I also wonder if Pamela ever became aware of the irony of this condition. I can only hypothesize that Pamela, experiencing her life as an ordeal, modeled “the giantess, the frightening fairy-tale figure who” in her “childhood seemed immense enough to knock against the stars and hold counsel with God.” She modeled what she believed to be strength and resilience. This is a collection of three stories by P. L. Travers, author of Mary Poppins. Although the title mentions "Christmas Stories", this was not a collection of stories about Christmas. They were written as stories that she wrote as Christmas gifts. Christmas was briefly mentioned in a couple of the stories, but that was it. I didn't think they were outstanding stories, but I did enjoy the second one of the heathen Chinaman named Ah Wong. He was a humorous man. I can't say this is a favorite book, This is a collection of three stories by P. L. Travers, author of Mary Poppins. Although the title mentions "Christmas Stories", this was not a collection of stories about Christmas. They were written as stories that she wrote as Christmas gifts. Christmas was briefly mentioned in a couple of the stories, but that was it. Virago’s delightful Christmas gift book for 2014 was P.L. Travers’ Aunt Sass: Christmas Stories. 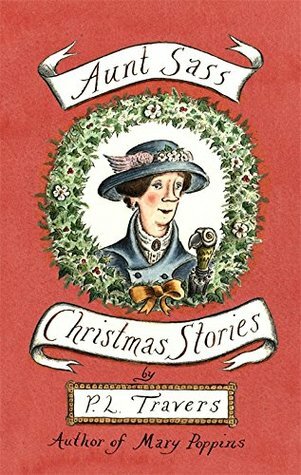 In the early 1940s, Travers – most famous, of course, for her charming Mary Poppins books – wrote these stories, which she gave as Christmas gifts to her friends. Each was published in a limited run of 500 copies – ‘Aunt Sass’ in 1941, ‘Ah Wong’ in 1943 and ‘Johnny Delaney’ in 1944 – and they are now available to a wide audience for the very first time. In Aunt Sass: Christmas Stories, Travers focuses Virago’s delightful Christmas gift book for 2014 was P.L. Travers’ Aunt Sass: Christmas Stories. In the early 1940s, Travers – most famous, of course, for her charming Mary Poppins books – wrote these stories, which she gave as Christmas gifts to her friends. Each was published in a limited run of 500 copies – ‘Aunt Sass’ in 1941, ‘Ah Wong’ in 1943 and ‘Johnny Delaney’ in 1944 – and they are now available to a wide audience for the very first time. In Aunt Sass: Christmas Stories, Travers focuses upon three quite unusual characters, all of whom inspired her childhood. They range from ‘eccentric great aunt’ Christina, who was known as Sass and was the inspiration for Mary Poppins, to a Chinese cook and a ‘foul-mouthed ex-jockey’. Victoria Coren Mitchell’s foreword is rather lovely, and so nicely written. She begins: ‘These stories should be a delight for any reader, but particularly magical for fans of P.L. Travers; great masterpiece, the Mary Poppins stories. Many of the preoccupations of those wonderful novels appear in these pages: merry-go-rounds, gorgon nurses, small dogs, smart hats, suns and moons and comets and constellations’. As in Mary Poppins, Travers’ descriptions are lovely, and her characters sparkle with vivacity from the moment in which they are introduced. Aunt Sass, whom it is believed is based upon Travers’ own great-aunt Ellie, is ‘stern and tender, secret and proud, anonymous and loving’. ‘Like Mary Poppins,’ writes Coren Mitchell, ‘she twinkles and snaps in spits and spots’. In her title story, Travers describes the way in which ‘Everything in the world came back to herself – or her family. She used notable people simply as a background for her own life… The universe and other unknown worlds swung about the central pivot of Aunt Sass and those nearest her… She was like the central shaft of a merry-go-round. When her whistle blew the family revolved about her like so many wooden horses’. Parallels can certainly be drawn between Aunt Sass and Mary Poppins in sentences such as this: ‘The gruff words were immediately discounted by the smile that lit the grim face with a radiance more moving than beauty’. In ‘Ah Wong’, a family of Australian children try to convert their quirky Chinese cook to Christianity, with some quite amusing results. In the third and final story, ‘Johnny Delaney’, the title character, with his ‘little thin bow-legs’ and ‘black, Irish head’, works on the family’s plantation and is a jack-of-all trades: ‘I suppose you would have said that he was primarily a jockey. That, at any rate, was the form of address he preferred. But he was also groom, stable-boy and carpenter; even, when labour was short, a cane cutter, and sometimes a feeder at the mill’. In each successive story, elements of darkness creep in, and everything has a hidden depth of sorts. In Aunt Sass: Christmas Stories, Travers lets her readers in, just a little, to her craft: ‘We write more than we know we are writing.’ The places which spring from her pen are so richly described that it does not take long for the scenes which she depicts to become vivid. The title of this book, though accurate, might be a little misleading. The three stories in this collection have nothing to do with Christmas except that Travers wrote them as Christmas gifts for friends and family. The title story is the best of the lot and, according to the foreword, may be the basis for the author's very famous "Mary Poppins." It's a delightful read and is well worth your time. The other two stories are fun, but didn't captivate me nearly as much. If you love "Mary Poppins" o The title of this book, though accurate, might be a little misleading. The three stories in this collection have nothing to do with Christmas except that Travers wrote them as Christmas gifts for friends and family. If you love "Mary Poppins" or if you're just looking for a quick holiday read, this short compendium may do the trick. I am glad to have read these right now as it reminds me what my struggle is with the new Mary Poppins movie by Disney. They are just not true to what Travers was trying to accomplish with what she wrote and the reason that she wrote. These stories are PURE Travers. They allow for the darkness that children face but need help managing, which is what she was all about. Warning: there are three stories and only the final one has anything to do with Christmas. They are labeled as Christmas because s I am glad to have read these right now as it reminds me what my struggle is with the new Mary Poppins movie by Disney. They are just not true to what Travers was trying to accomplish with what she wrote and the reason that she wrote. These stories are PURE Travers. They allow for the darkness that children face but need help managing, which is what she was all about. Warning: there are three stories and only the final one has anything to do with Christmas. They are labeled as Christmas because she wrote them to give as Christmas gifts. But, that last story ends with a true Christmas punch that did bring on the tears. "Johnny eyed her viciously, 'This wan's black with loving!' Black with loving. Curious phrase. Our parents shook uncomprehending heads and left it hanging in the air, another of Johnny's mysteries. Had they argued they would have said conventionally that love is always bright. Johnny knew better. He saw the child in her coils of passion and knew she was lost from the start. For the child and for Johnny love was heavy and silent within them." Lovely autobiographical stories from the author of Mary Poppins. The title refers to the fact that P L Travers would give these stories away as gifts at Christmas, and not to the setting/theme of the stories themselves. These stories aren't actually Christmas-themed, but rather were originally written by P.L. Travers as Christmas gifts. The narrator was fantastic and the stories had a real sense of voice and of place. I probably should re-listen to the audiobook to appreciate this collection a bit more though. And I really should read Mary Poppins one of these days! 3 autobiographical stories set in the author's native Australia. Loved the story about Aunt Sass who was the inspiration for Mary Poppins! P.L. Travers is a wonderful storyteller! This was a lovely collection of (embellished?) personal recollections/narratives written as Christmas gifts to family members of P.L. Travers. Quite a lovely collection! To be honest, the first time I read Mary Poppins, I wasn't particularly fond of her. Perhaps I wasn't paying close enough attention. The redeeming qualities and genuine love Travers has for the inspiring force behind Poppins, her Aunt Sass, come through loud and clear in the first piece in this collection. It made me wish I could This was a lovely collection of (embellished?) personal recollections/narratives written as Christmas gifts to family members of P.L. Travers. Quite a lovely collection! To be honest, the first time I read Mary Poppins, I wasn't particularly fond of her. Perhaps I wasn't paying close enough attention. The redeeming qualities and genuine love Travers has for the inspiring force behind Poppins, her Aunt Sass, come through loud and clear in the first piece in this collection. It made me wish I could have met her, myself! The same can be said for Ah Wong and Johnny Delaney, in truth. All of them prickly and yet deeply feeling, deeply caring individuals underneath their façades. I loved this little gem of a book but I must say up front that first of all, you must like P.L. Travers and have had to read one or more Mary Poppins books NOT the movie. Secondly - and maybe more importantly, you should have read "Mary Poppins, She Wrote", the biography of P.L.Travers. "Aunt Sass" includes several short stories Ms. Travis wrote as gifts. Each contains a character or two drawn from her own childhood in Australia. I do not believe I would have enjoyed these gems if I didn't have t I loved this little gem of a book but I must say up front that first of all, you must like P.L. Travers and have had to read one or more Mary Poppins books NOT the movie. Secondly - and maybe more importantly, you should have read "Mary Poppins, She Wrote", the biography of P.L.Travers. The author of "Mary Poppins" fame pens a tribute to three people who helped form her childhood and also had a hand a in raising her as well. Aunt Sass is a composite of her Great Aunt with whom she lived, and became the genesis for her Mary Poppins character. Their Chinese cook gave her many insights into other cultures and much wisdom to her world. Johnny Delaney taught her many things, some that her mother and aunt did not approve of. All are memorable and delightful to meet and ponder. Not Christmas stories at all but stories about people who shaped a young PL Traver's life. The story about Ah Wong made me cry, Johnny Delaney made me laugh out loud, and Aunt Sass was just good. Excellent time capsules of social and economic attitudes in Victorian Australia to be read with that time period in mind. A fond remembrance of loved ones that influenced the life of the author. Though the people written about may have seemed hard or mean to the outside world she lets us look through her eyes to see the truly warm and tender hearts beneath the exterior. Fans of P.L. Travers will recognize the characters in her books, from her real life experiences. A quick read if your not interrupted! 3 memoir style short stories written by Travers to various members of her extended family as Christmas gifts. Each was a character study/tribute to someone that was influential to her upbringing in her early childhood. It is particularly of note how many attributes these real life people share with Travers' most famous fictional character, Mary Poppins. Christmas stories only in the sense that they were written to be Christmas presents. This one has three portraits, Aunt Sass, Ah Wong, and Johnny Delaney, all people important to Travers in her childhood, all wonderful characters. Actually Aunt Sass is the least attractive of the three, but maybe she (Travers) put all the good stuff into Mary Poppins. These little character studies are fun and interesting, but calling them Christmas stories does them a disservice. I understand that they were written as Christmas gifts, but they are not Christmas stories. My kids were extremely confused. A gem! Not really Christmas stories, so good for any time of the year! A wonderful glimpse into PL Travers’s early life and her inspiration for Mary Poppins. All three stories are unique and tug at the heartstrings in a non-sentimental, but poignant, way. It’s a keeper for me. Tre piccoli racconti, storie di bambini a contatto con adulti stravaganti, ricchi di umanità nascosta dietro atteggiamenti a dir poco burberi ma da cui sono affascinati. Un mondo ai limiti della realtà. First time reading P.L. Travers. Oh my goodness what a treat. I found the first story hilariously funny. The third story I found very sad and touching. But the story of Ah Wong was brilliant. I couldnt get enough. Three exquisite portraits in miniature: a redoubtable aunt, a Chinese cook and a hunchbacked jockey. Travers's memories of characters from her childhood are astringent and loving, funny and bittersweet. A tiny delight. 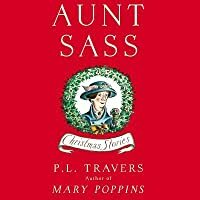 Fans of Mary Poppins will love Aunt Sass, written as a story for her friends but perhaps based on a relative of PL Travers. The other two stories in this charming little book could be based on employees of Travers' parents, Chinese cook Ah Wong, and Irish Johnny Delaney. Masterfully crafted stories that gave me a glorious glimpse into PL Travers' life and imbued even more meaning into the Mary Poppins series. Absolutely lovely. This book is fully of great character studies ... whose personalities have not weathered the test of time very well. It is a charming period piece. Pamela Lyndon Travers was an Australian novelist, actress and journalist, popularly remembered for her series of children's novels about mystical nanny Mary Poppins. She was born to bank manager Travers Robert Goff and Margaret Agnes. Her father died when she was seven, and although "epileptic seizure delirium" was given as the cause of death, Travers herself "always believed the underlying cause w Pamela Lyndon Travers was an Australian novelist, actress and journalist, popularly remembered for her series of children's novels about mystical nanny Mary Poppins.